January 13, 2019 - A NEW CAMERA! I am excited to announce that I have finally made the turn to the dark side, and bought my first professional digital camera - a spiffy 42 megapixel Sony A7RIII and Sony 24-105 G series zoom lens. I will continue to use my 6X7 film camera, but for backpacking and serious off trail photography I will be using the Sony camera more - the Sony camera and lens weigh 5 pounds, the film camera and lenses weigh about 20 pounds ... it is time to give my knees and back a break! The Sony camera comes with many new mind boggling capabilities and I have been enjoying exploring photography in new fresh ways. And, the final test is the final print, and I am pleased to say that I find the first 22 by 32 inch print from the new camera to be very nice - just as sharp and clean, just mysteriously different than using film capture. But enough of that! After very little time to learn my new camera, I rushed to the Maze District in early November - election day. It was nice to spend 5 days backpacking away from the election results. A friend and myself drove down to the Golden Staircase trailhead and packed into Ernie Country and the Fins. Just to mention, I have always called it Ernie's Country and it is noted as such on the maps, but at present I am reading a book with interviews of the first ranchers in the Maze, and they all named and called it Ernie Country, so I am sticking to their name. The image above was my first experiment at testing the Sony camera's ability to photograph the night sky - it is pretty wild what the camera can do. The above image was only a 6 second exposure! 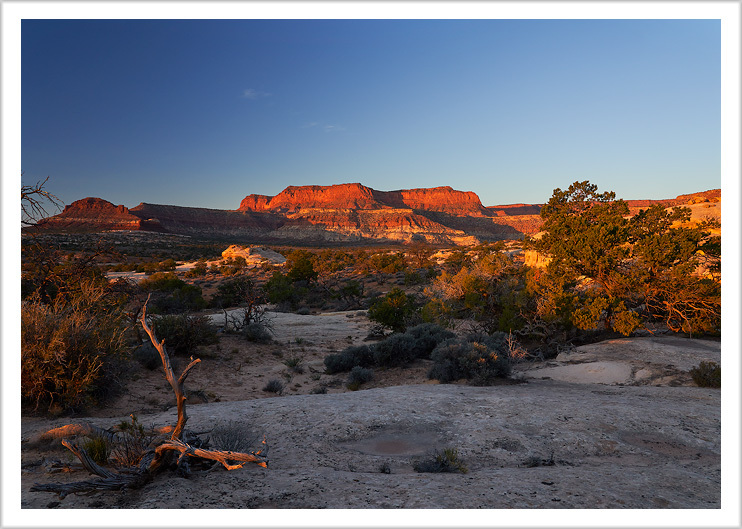 The next image was taken of sunrise in Ernie Country and is one of my favorite new images. 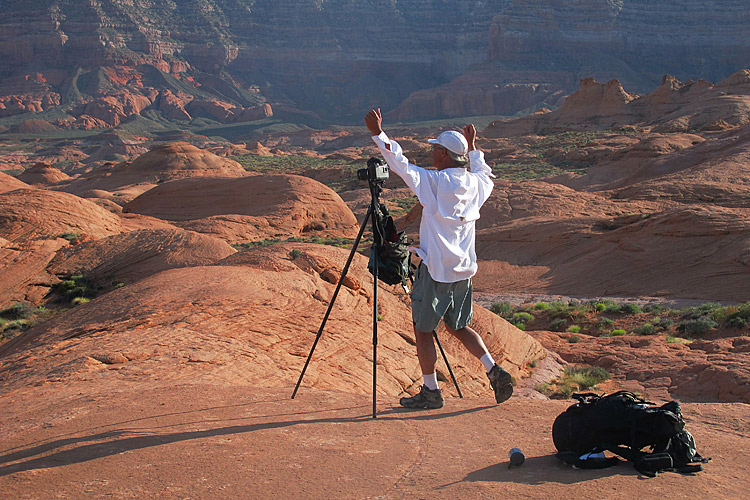 After Horseshoe Canyon, I went off on my own to have some solo time in the desert, just me and Sony! Being pretty tired with sore knees from so much hiking, I spent a couple days relaxing. AND, I had a 300 page book to read on how to use the Sony Camera. I spent most of two afternoons just laying in the back of my truck reading and learning the new camera. I found that it took me reading about 100% of it's capabilities in order to find the 20% that was useful for me. I spent many days exploring mostly familiar country around White Canyon, and the last day and night exploring country I only had time to drive through on the way to trailheads in the past. I took the following image at sunset there, and it is definitely one of my favorite. 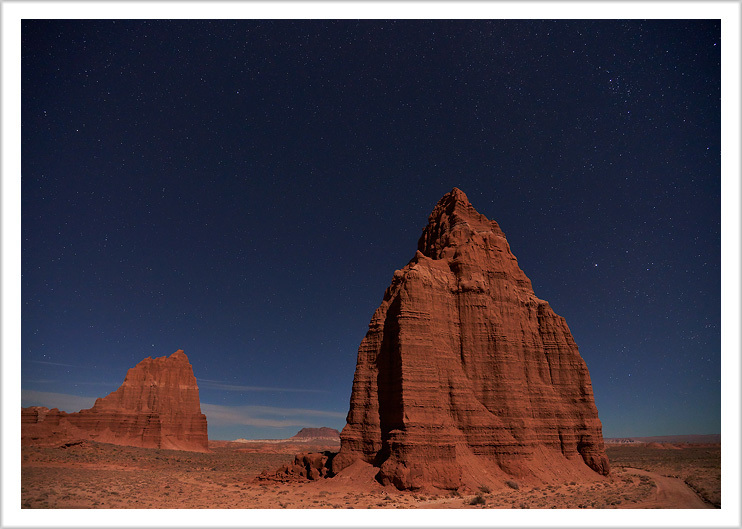 After White Canyon I spent an evening in North Wash and then headed to the Temple of the Sun and Moon in Capitol Reef National Park. The following image was taken at night with a quarter moon behind me to illuminate the temples. After the temples, I snuck over to the badlands northwest of Hanksville, where the Mars Research station is located. I am pleased to mention that they continue to run the research station, but alas I didn't see any astronauts riding ATV's in spacesuits this time! 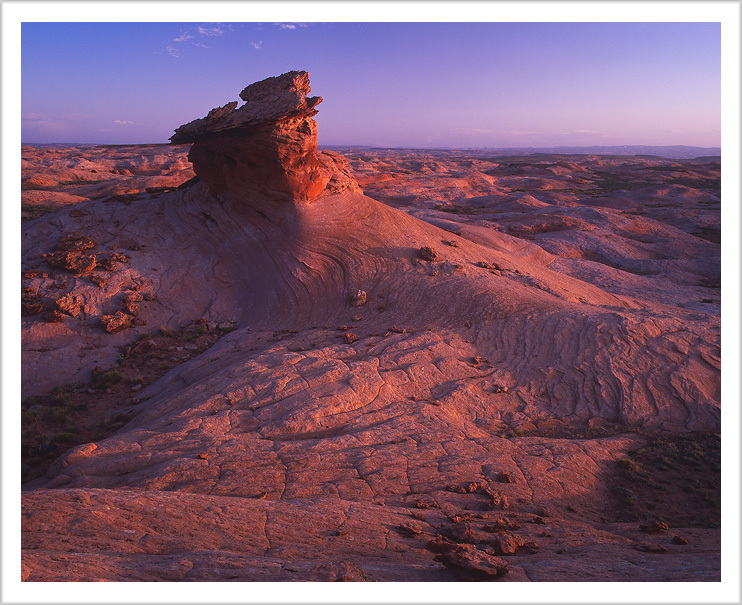 The following image is one I took of the badlands. 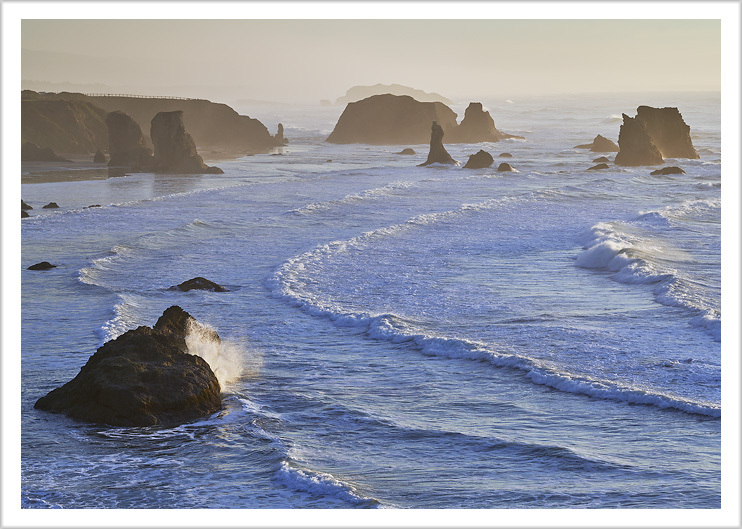 Of course, I enjoyed experimenting with many different photographs of the Oregon Coast. I even participated in the Labyrinth walk on Bandon Beach, a fun experience - just look it up on the net, the artist and team draw a fun winding pathway in the sand that you walk with many other people. And so that was the end of 2018 for me, with new adventures with my new camera. I can't wait to see what I scheme up for images of the natural landscape in 2019. 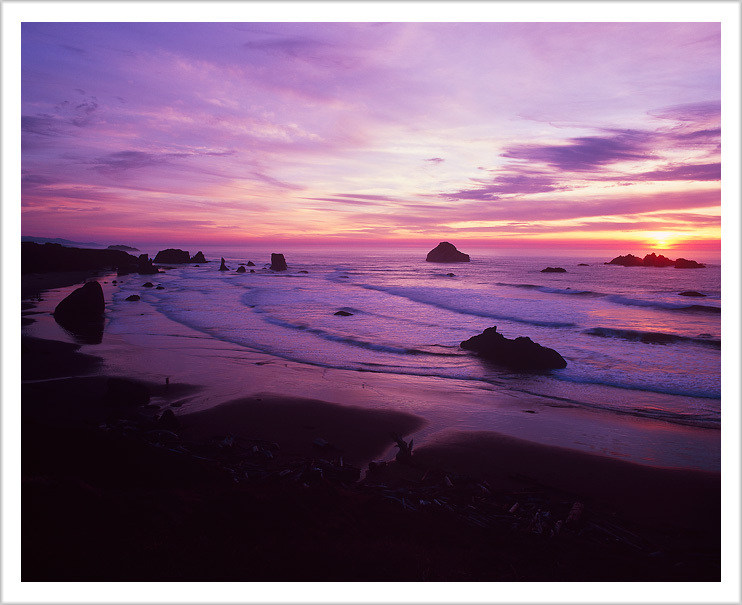 I will end this with one more image, of the sunset on Bandon Beach on New Year's Eve. Please enjoy! If I can, I try to spend the Summer Solstice in the Upper Pahsimeroi Valley. This year I did. The weather was a pleasant mix of heat, sun, rain, hail and storm. I had the intrepid company of good friends and a pleasantly lazy time spent pretty much in lawn chairs by the trucks. I continue to be surprised by how few people visit this special place, but, well, I am not complaining. I also spent a couple days in Copper Basin, where the flowers were wonderful. 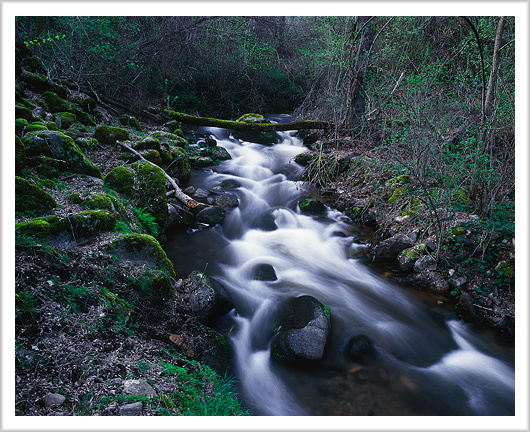 Below is a shot I took of Bellas Creek, with mystical silky water and the glow of green moss. My Spring outdoor adventures began with a cross country hike into the west side of remote Gravel Canyon, full of typical Spring desert weather, with cold, snow, heat and sun. The ruins we found there seemed less sophisticated, older, and unfortunately completely scoured seemingly a long time ago. The good news is that despite the area being recently removed from Bears Ears Monument protection, we did not see any evidence of returning the area to the uranium mining activity from back in the 50's. Yet. My 2nd week was spent doing many day hikes with other friends, exploring the Circle Cliffs area, including a nice hike into Little Death Hollow. I think I have some more exploring to do with the big camera around Little Death Hollow. 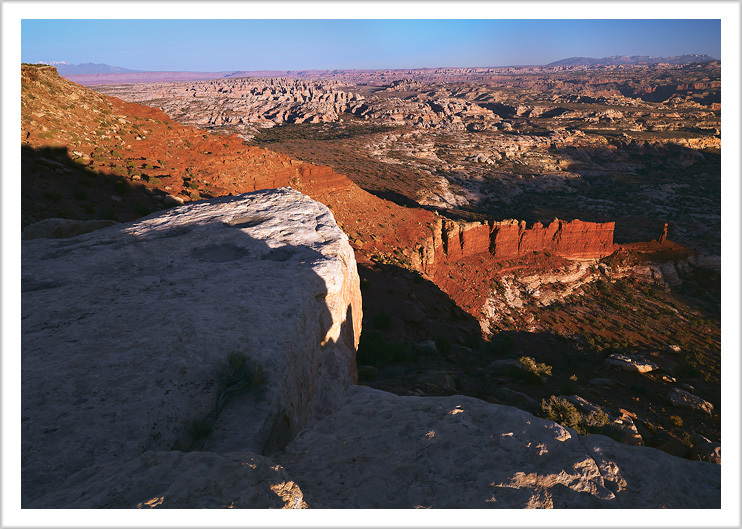 Then I went solo, driving for the first time up onto the 50 Mile Bench, above the lower Escalante Canyons. It is an interesting drive to get up there, quite a sustained steep road, one I would not want to drive in a rainstorm! The area looks to be very rarely visited, and the road to the end barely wide enough for one vehicle. From there, I spent some wonderous time in one of my favorite places on earth, the slickrock above Davis Canyon near the end of the Hole in the Rock road. After a few days of stormy weather, including sitting in the back of my truck reading a book written by a woman recovering from a lightening strike (while lightening struck around me), I finished my time photographing in Long Canyon on the Burr Trail road. The light that reflects off the canyon wall in the mornings makes the shadowed other side of the canyon acquire very color saturated effects. And now it is almost Summer. I hope to do a bit of photographing in the Lost River Range soon, and then I will just have to see how the rest of Summer pans out. Hopefully the fires will not be too destructive, including up my own forested valley! 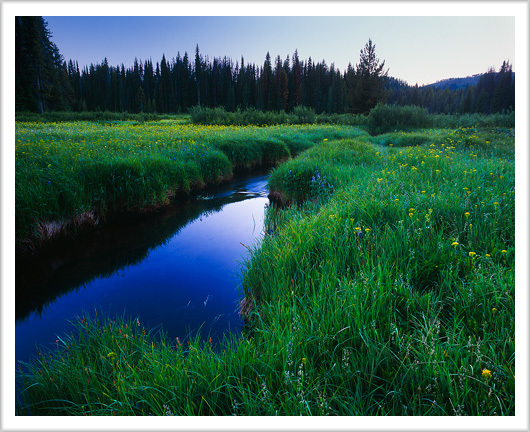 My Summer in Idaho was seriously side-tracked by taking a 60 hour a week seasonal job with the National Fire Center, but I am pleased with what little time I had to photograph nature in short spurts - this picture of the outlet stream of Goat Lake is one I find very pleasing to the eye. By mid November I was free once again to pursue my photography, and in the course of a month the two road trips I took produced quite a large number of good photographs, so I do not feel like my 2nd half of 2017 suffered much in the creative department. I started my Fall trip in Zion National Park, which was disturbingly crowded even for the last week of November. Oh well. One interesting experience was on the hike back down from Hidden Canyon. For anyone familiar with the hike, there is a quite exposed narrow walkway, and this is where I ran into a young woman forcing a reluctant bull dog up the trail ... I didn't say anything, and I suspect she would have claimed that her dog was a service dog and did not have to adhere to the Park's rules against dogs on the trails. I also had a quite enjoyable return hike to the top of Angel's Landing, with perfect Fall weather. Unfortunately it was not a hike I could justify carrying 35 pounds of film gear, getting around other hikers going the other way was enough of a challenge already. 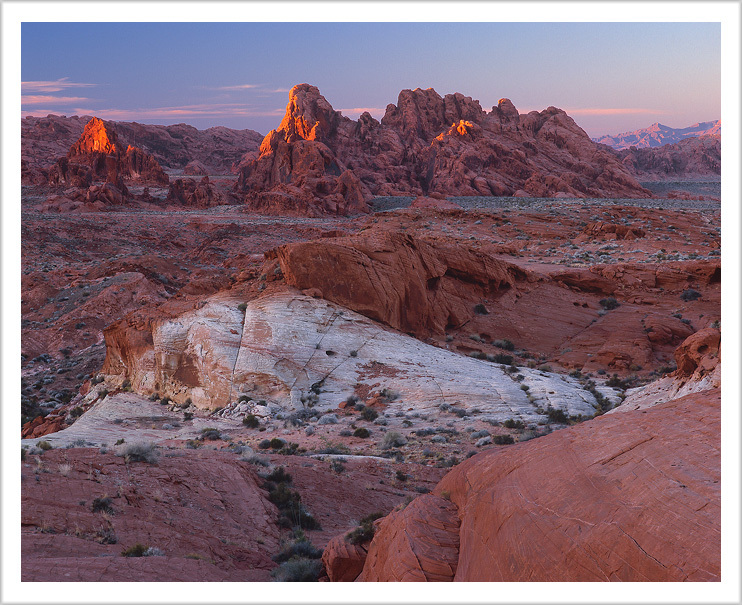 I had never been to the Valley of Fire State Park in Nevada before, so it was an enjoyable new adventure. I really like this image of last light, which I took off the beaten path in the north part of the Park, the colors of stone and sky seem just wonderful to me. 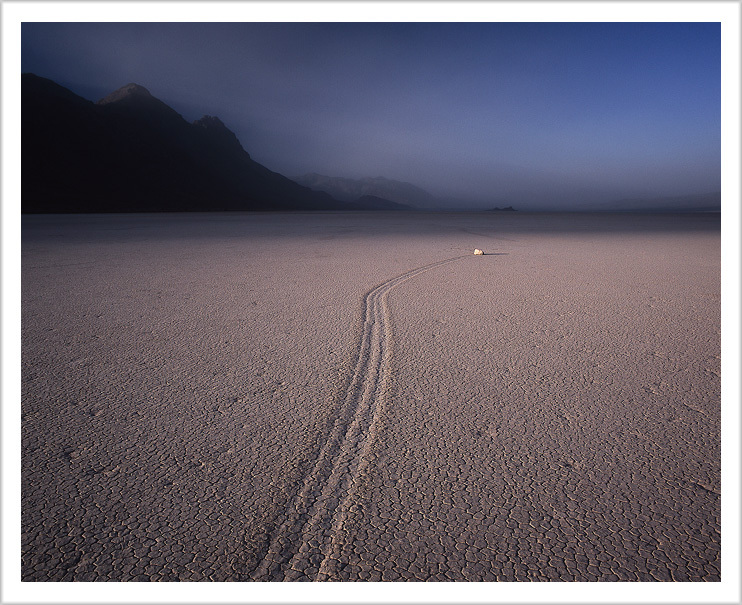 I am very excited about this image of a solitary moving rock at Racetrack Valley in Death Valley. There was a sandstorm coming in from the north, and it made an interesting 'feel' of backdrop to the last light shining on this rock. It is one of my all time favorite images of nature, and it was heavenly to spend time walking on the playa enjoying this unique place. My 2nd road trip was to the Oregon coast, where for several days a friend from high school days was a wonderful co-hiker and excellent tour guide. This was my first experience with photographing an ocean coastline, and I feel like it was productive, and as always I feel pleased when I think the set of images I get are not necessarily common calendar picture material. And now I look forward to a Springtime adventure and many weeks of continuing my experiment of photographing nature. I am planning to visit a remote and pristine area of upper Gravel Canyon, both for photography and to explore seldom visited ancient ruins. I feel somewhat worried about this area, which has recently been removed from the protection of the Bears Ears National Monument. In years past I have run into old uranium mines and exploratory drill holes from the 50's, and I sure hope I don't run into a new batch! The scars, as far as human time is concerned, are permanent. Sunrise on Mars: Note - that is not snow! It may not be everyone's cup of tea, but I have always been drawn to the most mysterious and other-worldly that occurs in nature. This area was wonderful for that, and since it is so easy to get to I just may revisit the place in the future and continue the adventure of finding compositions, shapes, textures, in different light of day. 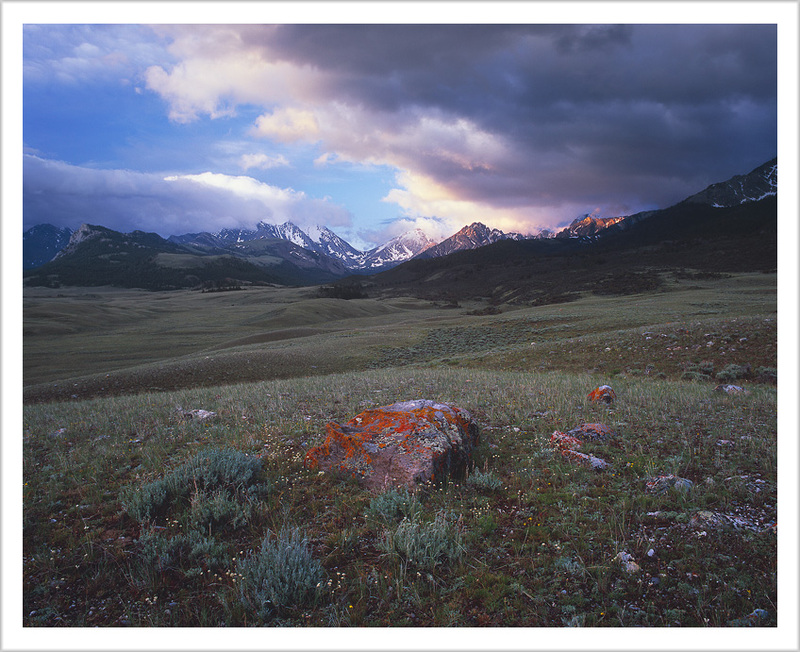 One of my biggest regrets of the visit to the area came one late afternoon as I sat in the windbreak of my truck with a whiskey, pleasantly tired from a day's exploring with the big camera. Without warning, and with not enough time to go find my digital point and shoot camera, a 'crew' of 8 astronauts in full suits, including helmets, sped past me on 4 ATV's! A very unusual ATV scene if I may say so. My second week alone was spent exploring many places, but mostly in the Cedar Mesa area. 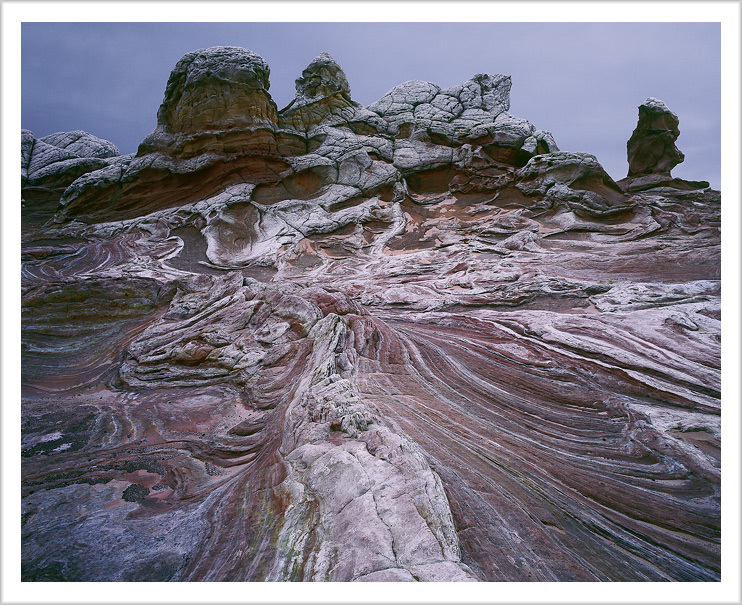 In the past I remember liking the carved slickrock area above Owl Canyon, and it was nice to spend some time there for the first time with medium format film gear. I did ask where the signs were for the new Bears Ears National Monument. Stay tuned ... at least as of June 18th it is still a national monument. Count me in as an aggrieved party if this changes. My third week of adventure began two weeks of enjoying the desert in the company of friends. We first met at White Canyon, to drive up to the head of Cheesebox Canyon to car camp then backpack into the middle part of Gravel Canyon. Gravel Canyon is becoming one of my favorite places, one still lacking crowds and retaining a feeling of the wild. 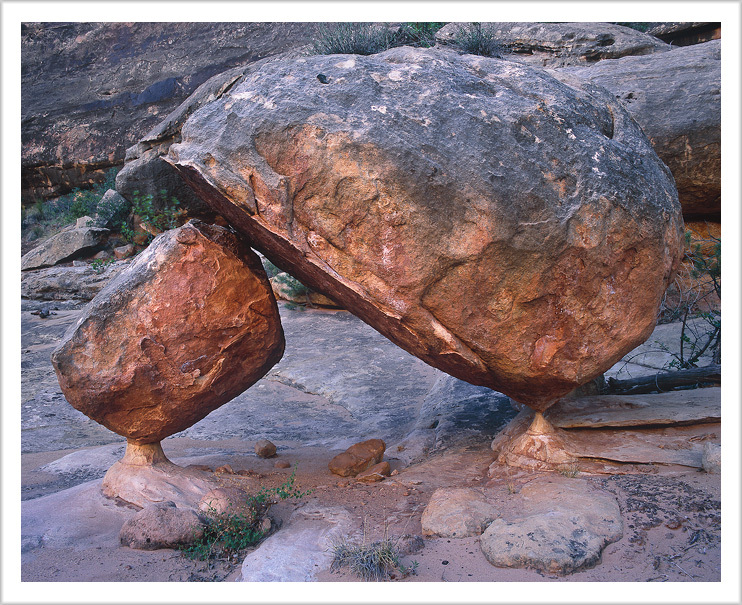 The precariously balanced boulders in the bottom of the canyon in the above picture are very rarely seen by a person. From Gravel Canyon I drove across northern Arizona to meet other friends in the Vermillion Cliffs area, a place most interesting for the simple fact that it is not very crowded unless you are scampering to get to the same place, 'The Wave'. Like Antelope Canyon, I personally never saw the sense in paying and scrambling to stand in line to take a copy of a picture taken at least a hundred times every day of the year. Still thankfully relatively un-crowded, it was nice to visit White Pocket again, it is a quite photogenic unique place. 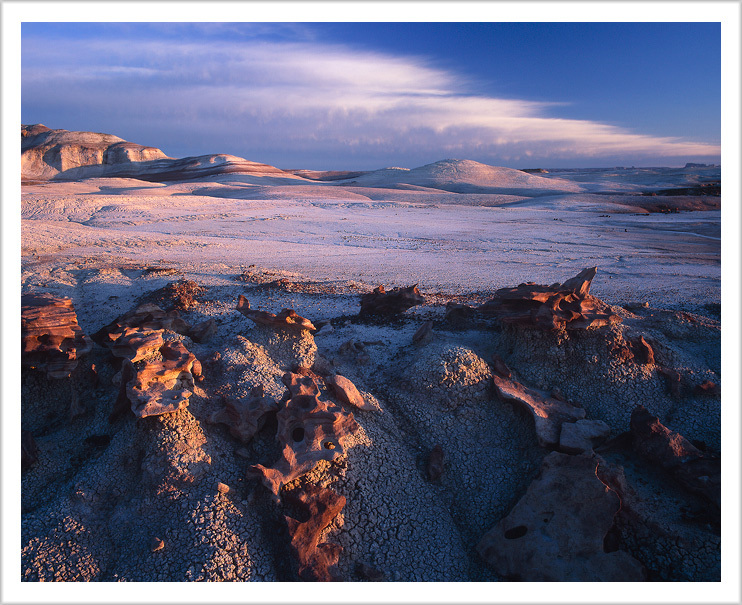 I have a special place at White Pocket that I photographed again - it is a quite challenging thing to do, I find, since film shots of the pre-dawn light put such strange things on film to interpret, to try to make an image of what it looks like when I saw it in low light. Now that I have been back for a bit over a month and have finished scanning the film work, I am pleased with my efforts just because I feel they represent things that I want to share of the moment - not with the intent to make 'market' images, but simply because I find them special that I want to share. As I wait for the Idaho high country to shed it's high snow levels to get up there before the possibility of another bad fire season, I otherwise refill my hummingbird feeder and enjoy the other happy birds up my forested valley. I suspect my next set of new images will be the result of the next 4 months of work, stay tuned for the next outcome of the adventures of the Greg Jahn Experience. It has been well below zero at my home the past few nights, so it seems a bit strange to write about the Summer forest fires just a few months ago. However, August had it's share of fire. Many places I take for granted to go for simple one day mountain bike rides were closed because of the fires. However, I was able to get into the White Clouds in July, before the fires, and, I spent a few days in the Sawtooths trying to do what photography I could despite the smoke. It was nice to scramble up Thompson Peak again, I had not done that in a few years. 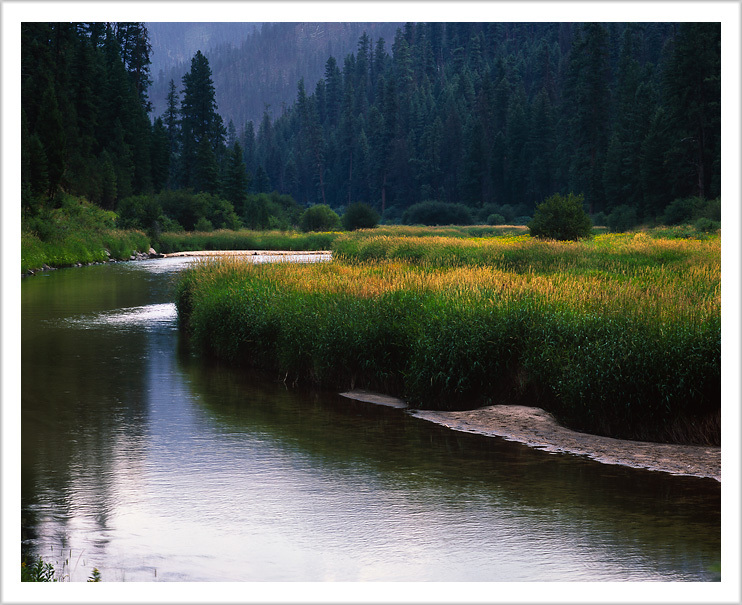 I also went to the Yellowpine Harmonica Festival for a guaranteed good time with friends ... it was on the drive to Yellowpine that I took the photograph of the South Fork of the Salmon River. I managed to spend part of September in Stanley Basin, with some pleasant day hikes into the White Clouds and Sawtooths. I always look forward to the Fall season, no bugs and the cool fresh air that comes with the first snows. Then, since I had the confidence of owning a newer truck, I decided I could justify spending the entire month of October exploring and photographing southern Utah. I dedicated the first week of October to photographing fall colors of high mountain aspens, then spent the last 3 weeks exploring new country more in the area surrounding Moab. 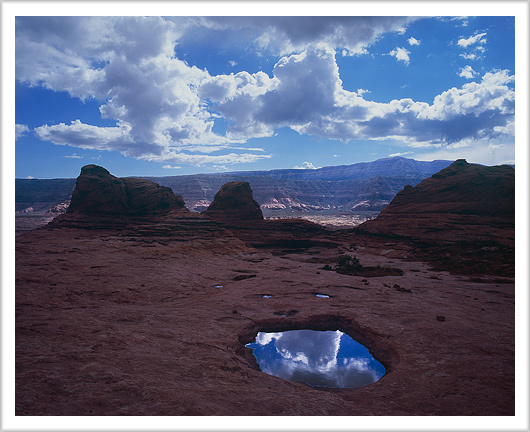 It is amazing what has happened to Moab when I compare it to back when I first went there in the early 80's! In past years I tended to get to southern Utah closer to the middle of October, when much of the high mountain aspen groves are past their prime Fall colors. This year I made sure I was down there right at the beginning of the month. I had never been in the Fishlake Forest, not far from the town of Torrey, so I decided I would start my explorations there. 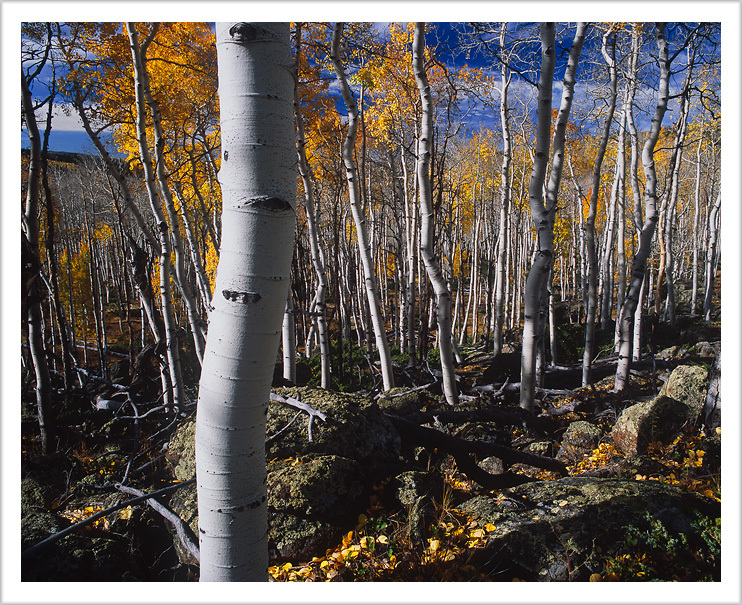 I had become aware of what is called the Pando Forest - an aspen grove determined to be all the same genetic male aspen tree, estimated to be 80,000 years old! It is considered to be the most massive living thing on the planet, and is located in the Fishlake Forest. It was magical to spend several brisk Fall days among this living giant. After a full week of high mountain aspens I headed to the Moab area, first revisiting the Fisher Towers and then new country in the LaSal Mountains area, ending the week at the Needles Overlook. I had been to the Fisher Towers once back in the mid-80's, when you could still backpack into the area. Things have sure changed ... I got my first exposure to the brave new world of experiencing nature, namely, very motorized with drones and people flying paragliders. I was reserving judgement on the use of personal drones until I had seen them in action - it took me less than a minute of listening to one to conclude they are very irritatingly noisy. I am very glad they are banned in National Parks. Still, it was nice to see the Fisher Towers again, and I will have many fond memories of sunset and sunrise at the Castle Valley overlook. Then ... back to Moab to meet friends to go into the Maze for a week. This was only my 2nd trip into the Maze, and I was very excited to explore more of that amazing country. Instead of risking destroying trucks to get into the Maze, we took what I consider a much more sane alternative approach - we paid a relatively minimal fee to have a jet boat take us the many miles down the Colorado river to be dropped off and picked up at Spanish Bottom. It had not occurred to me that after all these decades of exploring southern Utah, I had never actually been on the Colorado river! The ride down and back up the river was quite entertaining ... meeting many different personalities and generations of outdoor folks. The week spent in the Maze was wonderful and we covered a lot of country. The area definitely gives me the feeling that I could spend several lifetimes exploring there and still not be tired of the country. Just to mention ... if anyone by chance finds a nice little foam sit pad in Water Canyon, well, it is/was mine - large winds ripped it out of my pack the first night and I can only imagine how far it flew! 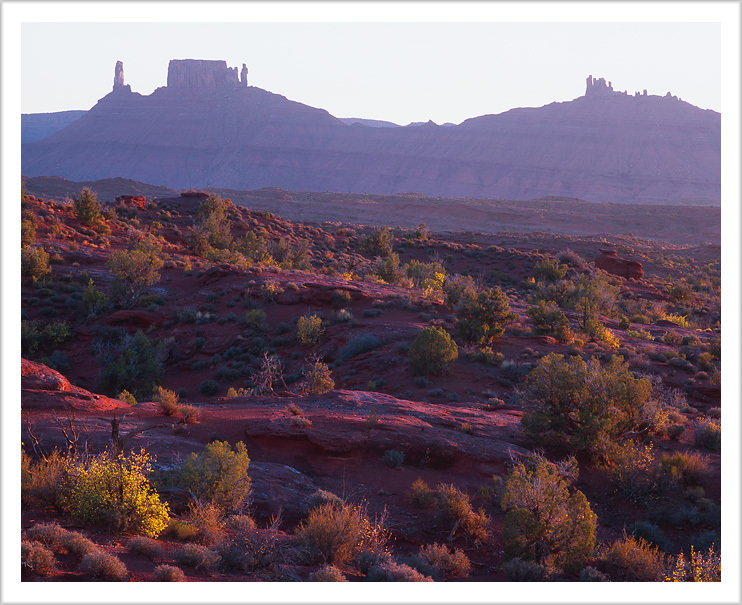 The last week of October was spent in the Cedar Mesa area. It was a pleasant surprise to see that in October there is still somewhere you can go in southern Utah to avoid large crowds. The entire time we spent on Cedar Mesa my friend and I had it all to ourselves! I always find it thought-provoking to spend time among the ruins of an entire civilization, not knowing what exactly happened to them ... I will resist the temptation to compare it to our own immediate future as a people! My trip ended in the Valley of the Gods, an area I just had to check out because of the name. 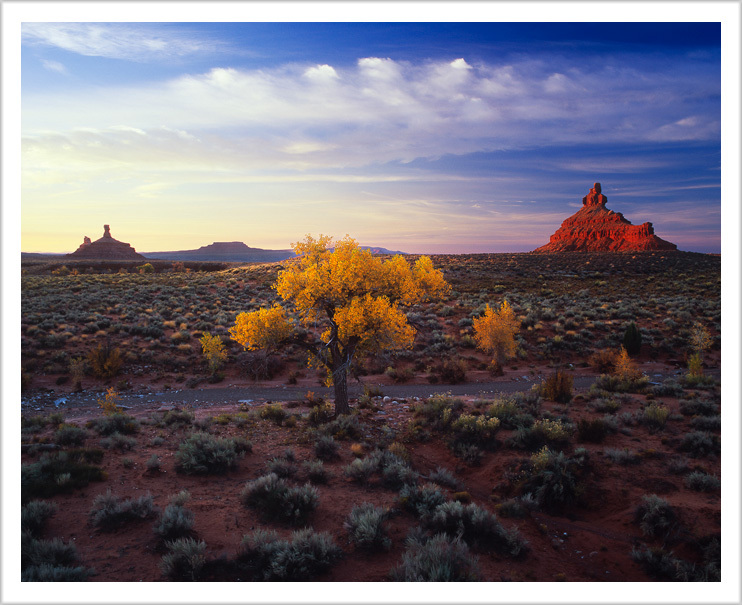 I can see great possibilities for landscape photography, and, it is BLM land and thus free to explore and photograph it's 'Monument Valley' similar look and feel. And so, this has been a long month and a half push to work on this recent set of film work of the past 6 months. I hope, as always, that people are enriched by the experience of viewing these recent works. And, HANG ON! Next year proves to be interesting! My dark purple 1999 Toyota Tacoma truck has been with me since the beginning of my full time professional photography career ... well over 200,000 miles of adventure. It never let me down, and it is now time for it to settle into a comfortable retirement doing light duty at a friend's home in north Idaho. I have already been on two photography adventures with my 'new' 2009 Tacoma truck, which has much more room and comfort features ... I must admit being able to open the passenger side window on a hot day just by pushing a button, and, not having my head touch the top of the shell while sitting up to read are ... nice comfort features. My first backpack trip of this year was a pleasant hike up into colorful slickrock, approaching the Red Breaks area in the Escalante Canyon system this time from the south. We found a wonderfully comfortable spot to pitch tents next to copious amounts of water in a series of wonderful pools, and the character of the landscape was a continuous joy to experience. After experimenting with photographing lupine flowers near my home this Spring, I snuck back to a remote area very seldom visited - the Upper Little Wood River. Other than outfitters during the Fall hunting season, people just don't go there! 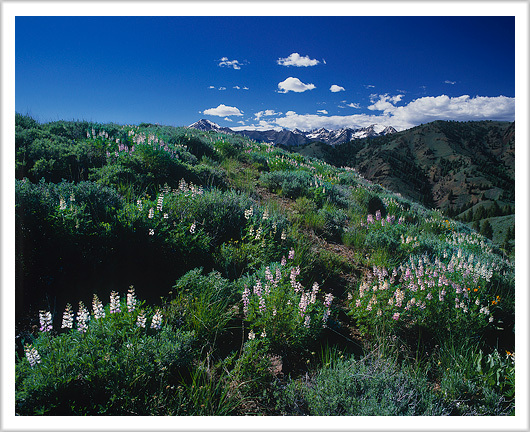 I like this unusual photograph of lupine flowers with the remote view of the Pioneer snowcapped mountains on the remote horizon. I can guarantee you you will never find another photograph from anyone else from this spot! In June I drove to north Idaho to retire my old truck and ... pick up ... my new pickup. I took a somewhat leisurely drive back home through Montana, spending time exploring the wonderfully magical cedar grove forests. I spent an evening at the Hobo Cedar Grove Botanical Area, where I had the wonderfully magical experience of sitting on a simple bench on a trail at sunset, next to a small stream - while I sat there enjoying the peaceful evening a marten came hopping along up the stream and into the interior of a large decaying cedar tree next to me. For about 5 minutes the marten repeatedly peeked its head up out of a hole and looked at me, sometimes with a dead mouse in its mouth, sometimes without. I also camped near Lolo Pass at a very nice high mountain meadow ... this was a particularly nice evening for me, since after reading Lewis and Clarke's journals last winter, I was camping in the same meadow that they camped at when they crossed the continental divide on their explorations..
Lewis and Clarke Camped Here! And now ... it is forest fire season! I am glad I managed to get into the White Clouds before the fires began, and now I guess I will just have to see how much smoke I will have to deal with on August trips into the Sawtooths. It has been a very busy Summer for me, evidenced by the fact I was only able to finish Spring film work by late July. One new exciting development is that I have now worked out the details for being able to offer my images printed on a metal surface. It has an entirely different look and feel that I am sure many people will like. AND, the prints on metal will be ready to hang - no mat, no framing costs! Please contact me if you are interested in this new option. 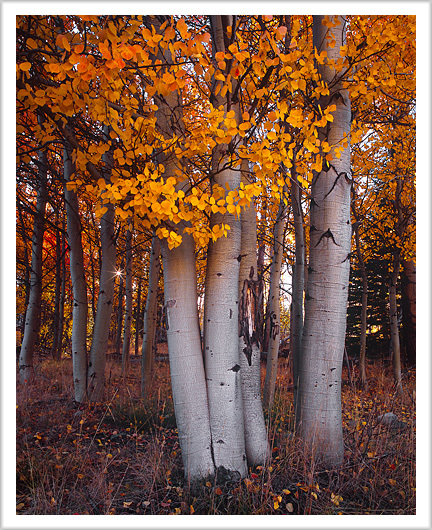 I began my Fall trip by exploring central Nevada, hoping to find good landscape photographs of the Fall season. I liked the idea of having very little information about the area, and just letting my exploration develop without a plan. While I did find the area interesting to explore, with a lot of solitude, my search of the hinterlands of Nevada revealed no Fall color and hardly anywhere that lent itself well to landscape photography. I did, however, find some interesting petroglyphs in an area called Mount Irish. In the future, I plan to explore Nevada's high country for the ancient bristlecone pine. By October there was already a lot of snow up high, and I guess I just didn't have the gumption for what it would have required in hiking and cold temperatures, to properly photograph in the snow at sunrise and sunset. One of the most entertaining places I visited had nothing to do with nature photography - I visited the town of Rachel on the Extraterrestrial Highway, and I even drove to the entrance gate to nearby Area 51, just for the fun of it. Alas, they did not let me in. 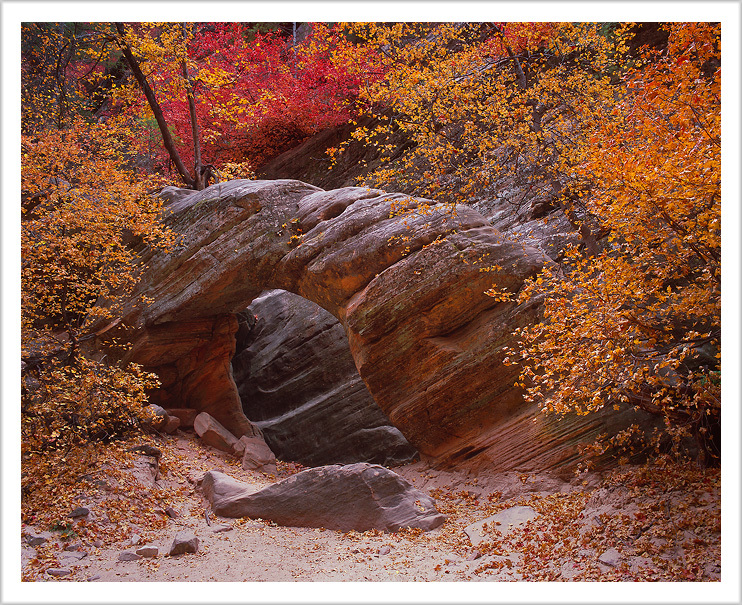 I then meandered my way to Zion National Park, where I had no problems finding both aesthetically appealing landscapes, and, Fall color. 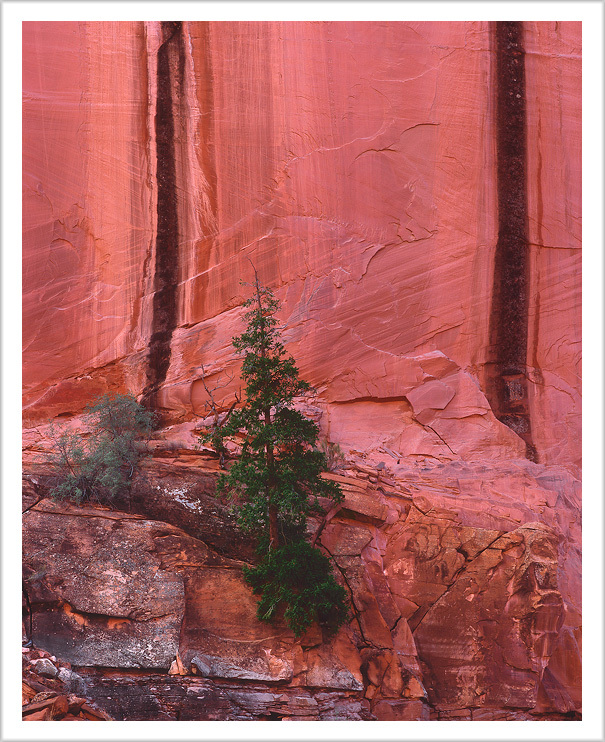 I had not spent time photographing Zion since the very wet Spring of 2005, and I am very glad I gave it a shot ... no pun intended. However, I was a bit in shock as I saw just how crowded Zion has become in the last 10 years. Even in late October it was 'full'. Just to mention, I did spend one night at the remote Lava Point campground in the park, which turned out to be not only Halloween but the last night the campground was open for the season. I mention this campground because it is at high elevation, small, quiet and free. Campsites are available as first-come first-serve, with no reservations. 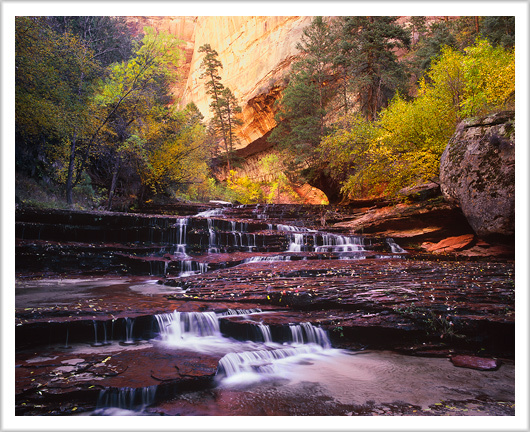 If you have several days to visit Zion, I would suggest planning on spending one night in this quiet and cool place with a wonderful forest and an amazing view down into the main canyons of Zion. 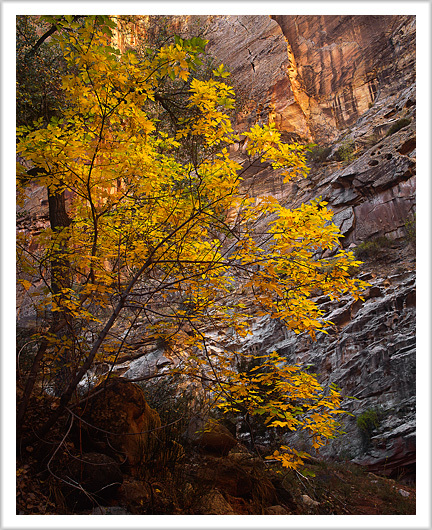 The Fall color in Pine Creek Canyon, the east entrance to Zion, was in it's peak, with some wonderful descriptions of leaves in a mix from green to extreme red. 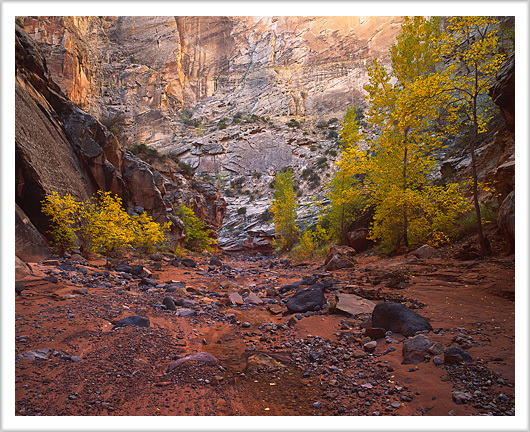 For the year 2015 and the last week of October, Fall color wasn't yet in peak in the bottom of Zion's main canyon. 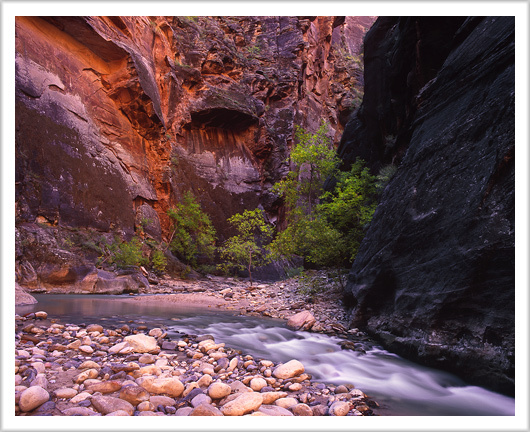 I enjoyed many of the hikes in the canyon, and finally for the first time hiked up the Narrows section of the Virgin River ... a quit popular hike for many people, many of whom I noticed were hiking in the water with the exact same foot gear. I asked, and apparently these shoes are commonly rented for the day from shops nearby in Springdale. If you choose to make this hike, this footgear will seem worth it when you do not have the unpleasant sensation of frozen wet feet for a few hours. I already had proper footgear, but nonetheless, when I reached my turnaround point at a side canyon, I was pleased to meet a stranger brewing hot coffee ... he offered me a fresh cup of hot coffee, and I shared the whiskey I had in my pack. After the long hike in the cold water, the whiskey-laced hot coffee really hit the spot! The photographic highlight of the trip was my hike to what is commonly called the Subway. Technically, it is called the oddly uninteresting name of the Left Fork of North Creek. Be forewarned that the Park limits the number of hikers to this spot, and you have a get a permit. For me, someone who still has no desire to own a cell phone let alone a smart phone, I was shocked to find out that I could not take care of the entire permit process unless I got on the government's web site! I had to drive to the nearby town of Springdale and go to their library, where they allow strangers 30 minutes of free internet access. I first had to enter the permit lottery, giving the web site my credit card information for the $5 fee, then, if you 'win' a spot, you still have to appear in person at the visitors center the day before the hike to pay a $10 permit fee ... I found this all quite surreal - the notion that in order to get a backcountry permit you had to have a credit card and internet access ... just so you could, supposedly, get away from the humdrum of 'civilisation'! ok enough of that. The Subway area was, as expected, quite phenomenally photogenic.The Fall colors were perfect, and I had to laugh at how easy it was for me to find and select dramatic compositions. 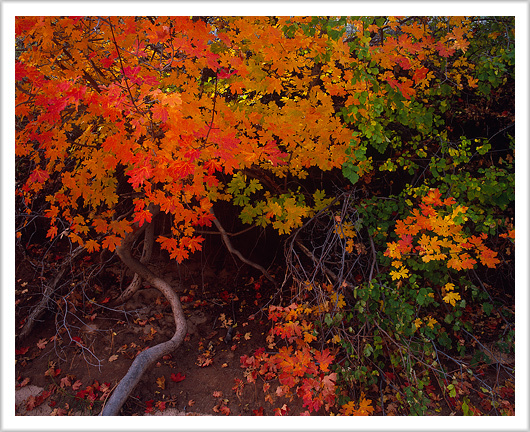 The following image is derived from a 30 second time exposure, during which each leaf of Fall color had time to swirl in interesting patterns. And now it is January, with finally a good winter season of snow up at my homestead in the mountains. As I type this report, my thoughts turn towards what new and exciting things nature will reveal to me this coming year. Nature seems to be an endless source of inspiration and ideas of what the natural landscape can be. I wish you happy trails and warm comfortable hiking toes for the coming year. Well. I had a wonderful Summer. At last count I managed 6 different backpacking trips in the mountains of Idaho. AND, most importantly, there were only about two weeks of forest fire smoke in August to thwart my photographic efforts. 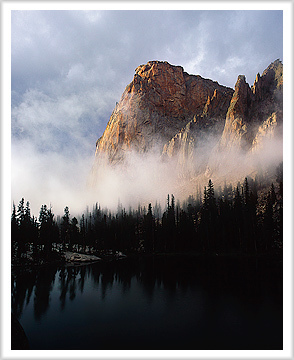 The photograph taken above, of Elephant's Perch and Shangri-La Lake, was taken after a dramatic mid-Summer storm. The Summer's backpack trips involved all possible weather, from hot and dry to rain and lightening, even one afternoon snowstorm. I began this Summer's photographic explorations by going backpacking in the Owyhee Mountains to a place called Camel Falls. I rarely backpack in the Owyhees for some reason. Hopefully this trip will inspire more exploration of this wonderful high desert country. 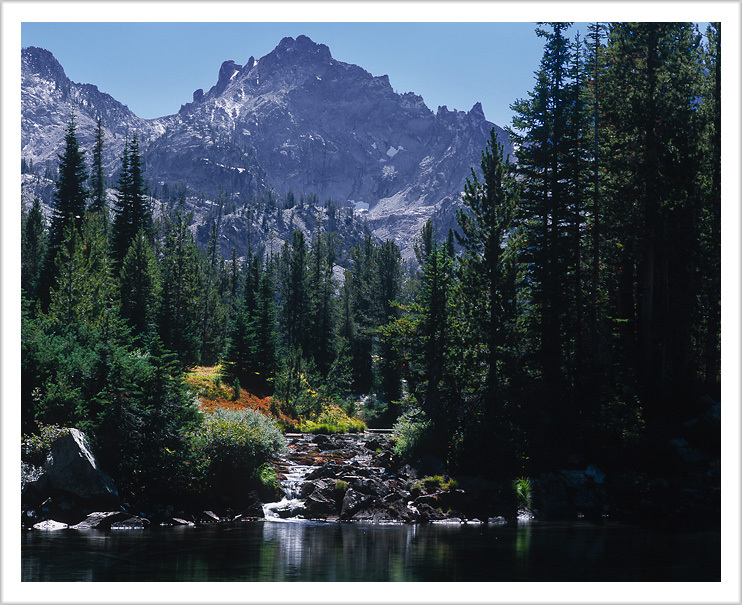 My next trip was to McGown Lake, just a short hike over a pass from Sawtooth Lake. I had never been there, and I found the combination of still-standing burnt tree forest and green meadow and stream quite magical. I also spent a night at Sawtooth Lake, pitching my tent in what I remembered as being the first place I pitched a tent in the Sawtooths way back in the early 70's. 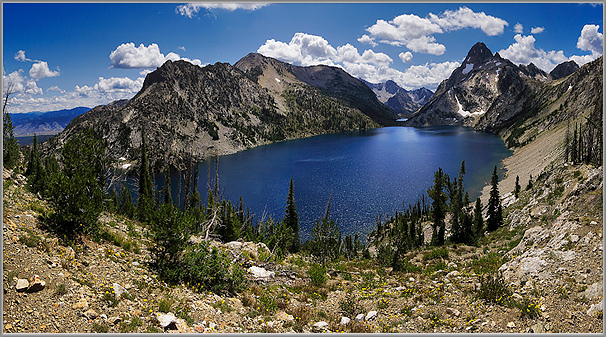 The following photograph was taken by my trusty digital point and shoot camera, made from multiple wide angle shots stitched together ... it embraces a wonderful view of the majestic Sawtooth Lake, and how it is so dramatically perched high in the mountains. In the final large print you can also see the town of Stanley in the upper left corner. My next destination was to the Pioneer Mountains, and in particular to photograph sunrise from Goat Lake. 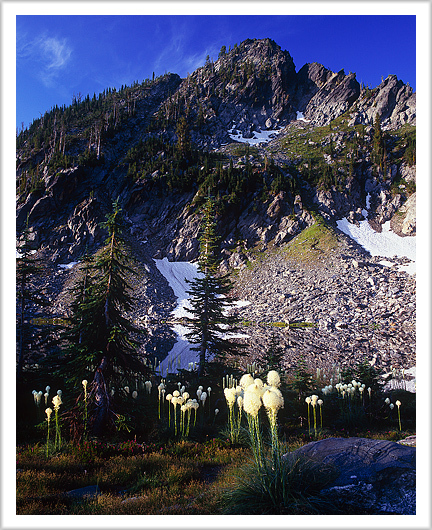 At over 10,000 feet in elevation, Goat Lake is claimed to be the highest named lake in Idaho. The following sunrise image of Goat Lake is derived from two wide angle medium format film shots stitched together ... a technique I am finding often useful to express what I feel being there in person. Whenever I go backpacking in the Sawtooths I prefer to spend one night car camping up Iron Creek, and I did this on both pack trips I took to the Sawtooths this Summer. 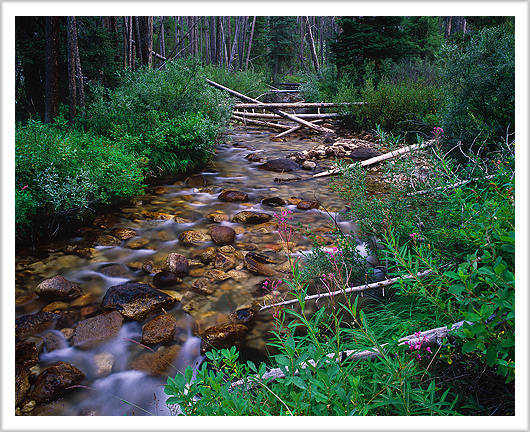 I took the following photograph of Iron Creek in early August, on a perfectly calm afternoon, and it was possible to get this long exposure shot of the fireweed flowers and creek in low light. After spending many wonderful days at aptly named Shangri-La Lake, exploring the deep dark forest and small meadows, I headed to the Lost River Range. The Lost River range has a wonderful and unique character to it, with curious disappearing streams and massive high walls of incredibly loose rock. Fossils are common in the rock wherever you go, and on the east side of Leatherman peak are a couple high mountain lakes that I think are only very rarely visited. The following sunset photograph is of the lake we camped at, with the distant view looking down into the West Fork of the Upper Pahsimeroi river. 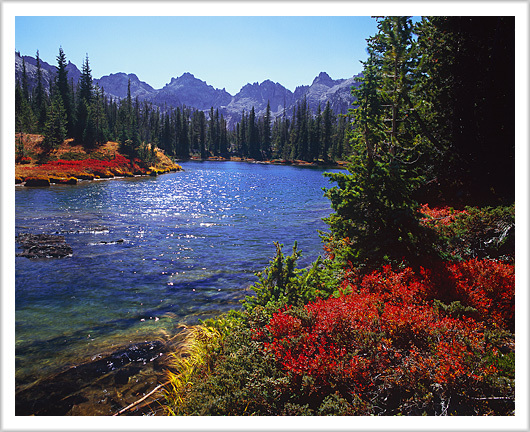 Technically, according to the map, this lake is considered the source of the West Fork. And now my thoughts are turning towards scheming up an adventure back in the Utah desert ... in fact I should probably be there right now! 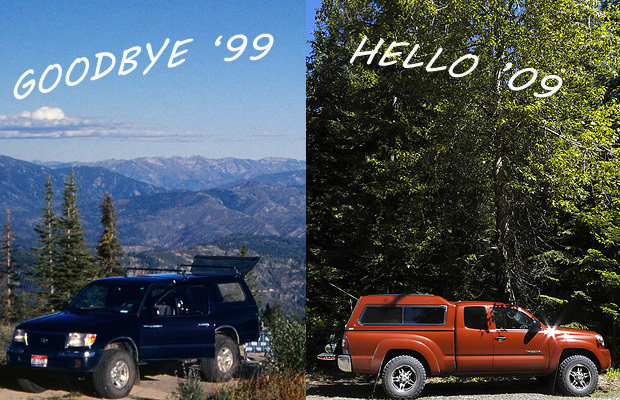 I hope you enjoyed the results of my Summer's adventures in the mountains of Idaho. And, as always, if you are in the Boise area I encourage you to contact me and come visit in person at my gallery. Happy trails! After many hot Summer days back here in Idaho, my Spring trip to Utah seems like from a time long ago. Now that I have finished working on the film from Utah I am ready to head for Idaho's high country before any forest fires make photography difficult if not impossible. My 3 weeks in Utah provided many variations of weather with quite a bit of the strong winds that seem common in Spring. This made every calm and beautiful still moment greatly appreciated and enjoyed by me. 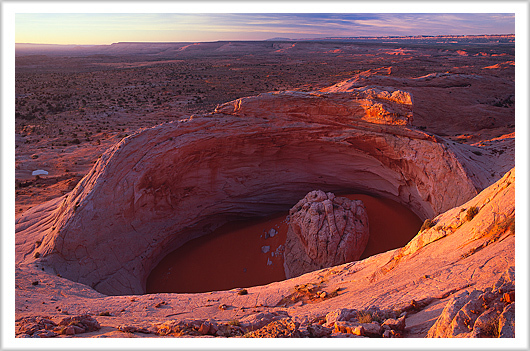 The photograph taken above, of sunset at Red Breaks, was one of the most extreme of these weather events. I had backpacked 3 miles through the deep sand to this remote place, and my tent was pitched about 20 feet behind me as I took this photograph. As I normally do when planning on photographing last light, I was cooking dinner early when an extremely strong and sudden sand storm hit. I had to choose between saving my tent or saving my dinner. As I stood holding down my tent, waiting for the wind to stop, I was surprised to see that my stove continued to burn and my pot of rice managed to stay on top of the stove. Once the wind died down, I checked my dinner, and, well, it was quite burnt and had a layer of about a half inch of sand on top of it despite being covered by the cook set's lid. I managed to eat the grim crunchy dinner with a stoic attitude, knowing I'd rather eat a burnt sandy dinner than spend hours looking for the remains of my tent. Not long after dinner everything became very calm and sunset was very nice. I began this Spring adventure photographing the view from Burr Point Overlook. 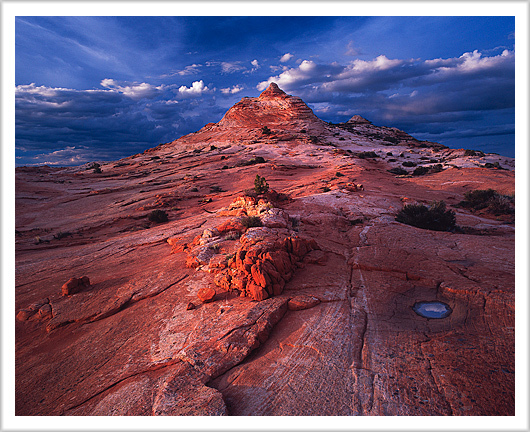 It is a quite dramatic and somewhat obscure place with a wonderful view, and only requires about 11 miles of driving a decent dirt road from where you leave the highway just south of the town of Hanksville. From the overlook, you look down on the mysteriously wonderful Dirty Devil river and all the canyon country to the south and east. After Burr Point, I spent the remainder of my first week returning to familiar places in White Canyon, and exploring new country. I have found I am enjoying more and more the simple approach of just picking a place I have not been and spending the day wandering through the country without an agenda nor any particular knowledge of the place. 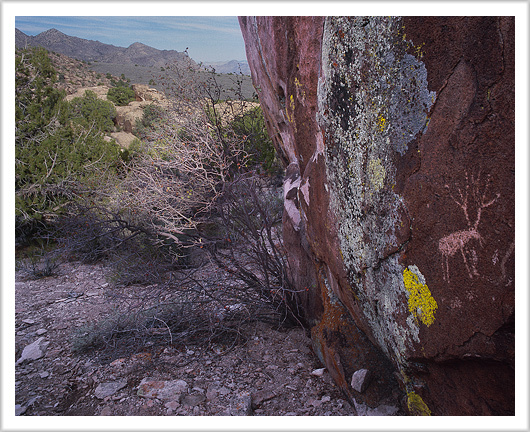 I returned to one of my favorite places to explore photographing carved stone - a spot near the bottom of Gravel Canyon. I have been to this spot at least once a year, sometimes in both Spring and Fall, for 14 years now, and I continue to enjoy the challenge of creating something new. The following photograph is one I am very excited about, and I feel like this proves to me that photographing a special place is never exhausted of new possibilities. I spent most of my second week exploring country near Escalante off the Spencer Flat road, with a two night solo pack trip into the Red Breaks area. This was new country for me and I was not disappointed. My excuse for a destination was to visit the once-secret carved stone formation that has somehow retained the name 'The Cosmic Ashtray'. It is a quite unusual and dramatic formation of sand-carved sandstone, and according to google's distance measurement tool for satellite imagery, the sand at the bottom is 210 feet wide! For the last week in Utah, I had planned to pack out onto the slickrock past Llewellyn Canyon near the end of the Hole in the Rock road. However, when my friend and I got to where you start hiking, the wind was SO bad, and the forecast was for nothing more than the same, that we decided it would be best to car camp and day hike ... as it was, I was still surprised that our two tents survived the winds intact. There were brief moments of calm weather, and purple sage were blooming like I had never seen before. On one of the most enjoyable and casual day hikes, I took the photograph below of the view across the endless slickrock to Navajo Mountain on the horizon. My friend managed to snap a digital camera shot at the exact moment I took this photograph, and I couldn't resist the temptation to show the images together. It seems hard for me to believe that my big film camera and I have been sharing adventures together for 16 years now. 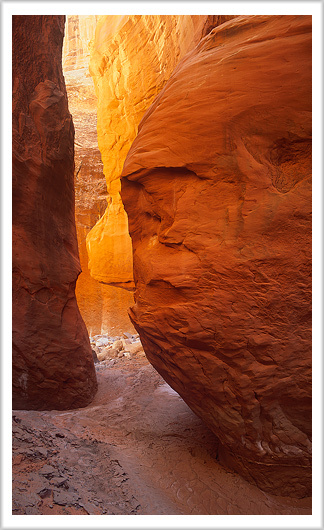 Please do take a moment to look at all my new images ... 24 of them, from this Utah trip - it is in the 'NEW WORKS' section that can be selected below 'IMAGE GALLERY' on all pages. If you have any questions please do not hesitate to contact me, and hopefully we will have a mild fire season here in Idaho and I will have many new Idaho images to share with you by this winter. The Summer and Fall seasons were very cooperative for photographing nature. In particular, last Summer was the first Summer in many years that was not fraught with thick smoke from constant forest fires. The Summer backpacking and photography season began with a wonderful 5 day backpack through the Sawtooths, starting at Petit lake, camping at Toxaway, Edna and Cramer lakes, and hiking out via Redfish lake. 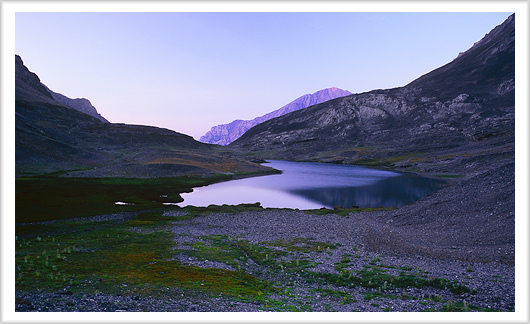 Of note for me, on this hike I brought a very old photograph with me, and I was able to find the camp spot at Edna lake where I had camped on my first solo backpack trip back when I was 15 years old. In the 40 years that have passed since I took that original photograph of my camp spot, I was surprised to see just how little the surrounding trees had changed. Apparently trees grow very slowly at that high altitude. In late July I spent several days backpacking in entirely new country north of McCall, to Hard Butte lake. Much to my pleasant surprise, the lake had a wonderful bloom of bear grass flowers. I had never seen such a nice collection of these flowers before. Apparently, these flowers only typically bloom every five to seven years. There is a mostly collapsed abandoned fire lookout on top of Hard Butte mountain, with spectacular views. The view to the west included the entire 7 Devils mountain range, ... lots of country. 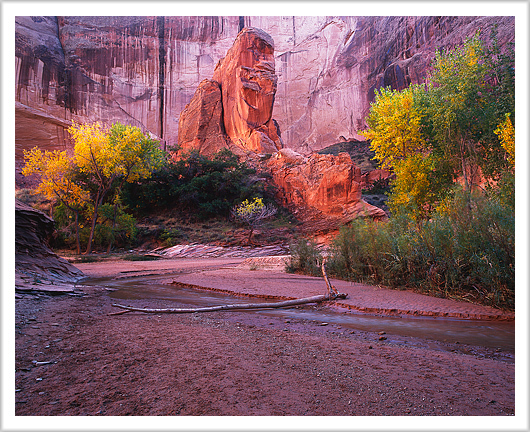 With the Fall season, I found myself on a few adventures that did not involve serious film photography, but in late October I was able to spend a quite magical, perfect week in Coyote Gulch in the Escalante River canyon system of southern Utah. In the past I had tended to avoid Coyote Gulch because it sees a lot of traffic, but there is a reason for this - it is such a beautiful, photogenic canyon. The numbers of people did not seem too bad, and everyone I met was very nice. The weather was perfect, and for my tastes the Fall colors were a perfect mix of greens and yellows, painting a wonderful variety of compositions that I took full advantage of. And so it was ... in the year 2014. I am inclined to thank everyone that purchased my works last year, and I look forward to meeting new people to show my works to this year. Don't hesitate to contact me if you get the urge to take the short drive north of Boise to visit my gallery! According to Neil deGrasse Tyson, photography is a form of time travel. So if inclined, join me on a trip to the past - the Spring of 2014. Spring this year seemed more busy than normal, with several print orders to fill and furtive searching for a replacement for my very much used, now broken film scanner. Despite very rainy weather on a trip to north Idaho, I was able to get a couple nice photographs of the new rich green colors of Spring on the Salmon River just north of Riggins. I spent most of the month of May in southern Utah, mostly exploring new country. Using Kodachrome State Park as a base camp when rain threatened to make backcountry roads undrivable, I explored new country down Willis Creek, Sheep Creek, a small section of the Pariah River and a slot canyon called Bull Valley Gorge. I was surprised by the scale of these canyons, they seemed to be almost on a par with how big and dramatic it is in Zion. 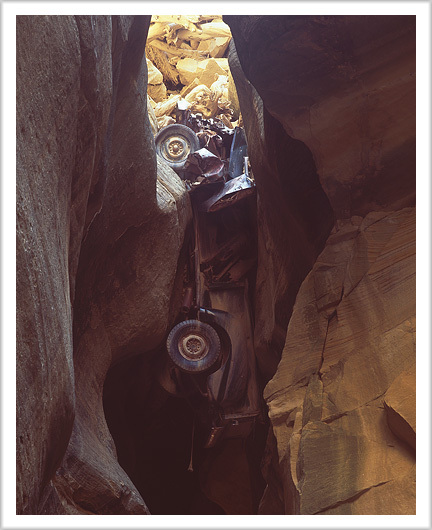 One day was spent hiking up Bull Valley Gorge from camp in Sheep Creek, where I found this most unusual truck wreck setting in the top of the slot canyon. As a matter of fact, the truck is part of the supporting structure for the road that crosses it. Apparently this accident happened in the late 50's, and unfortunately the 3 people inside did not survive. Then I started to work my way south, with an agenda to finally go see the infamous Wahweap Hoodoos. 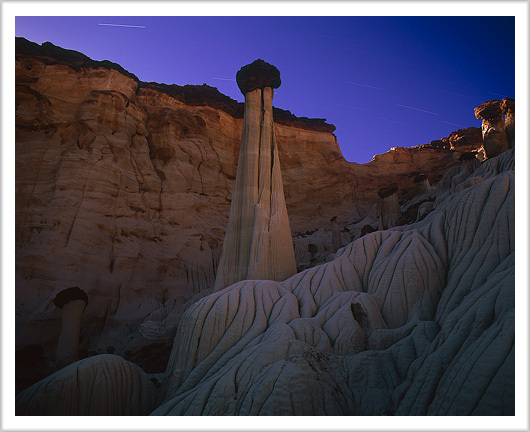 To get to the Wahweap Hoodoos requires a person to hike between 5 and 6 miles up a relatively firm and flat wash. There is no water there, so I had to pack water for two days and one night so that I could photograph the full moon, sunset and sunrise. I must mention one thing, less than 25% of the people I met in these areas was from the U.S., with the largest percentage of people seeming to be visiting from Germany. And so, while I relaxed at the Wahweap Hoodoos before setting up my trusty little one person tent, I had a very nice conversation with two women from Germany that were day hiking. The evening spent at the hoodoos was magical, knowing I was the only human in such a large area. As the full moon rose, I was joined by several coyotes that made the most unusual barking sounds ... I'm still curious what they were trying to say. 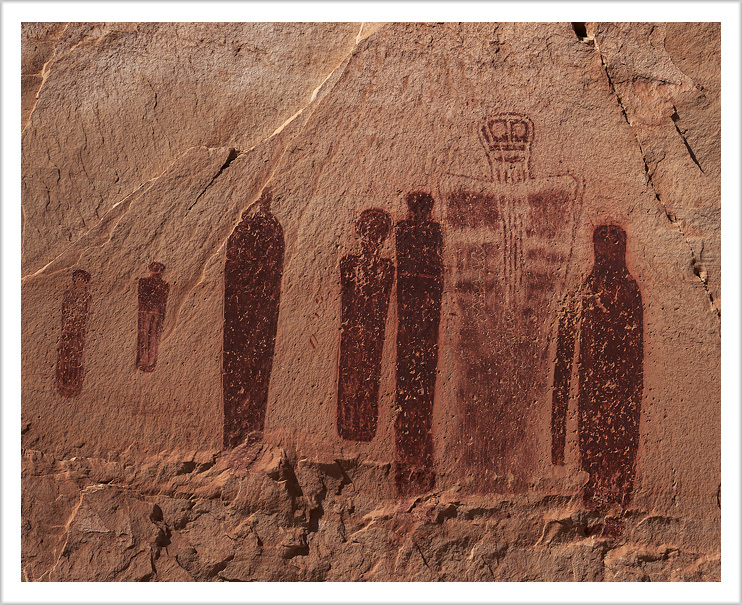 Ironically, because of a nearby part of the cliff, the light of the full moon never made it onto the hoodoos. Well, perhaps at around 3AM it did, but I wimped out and went to bed after making a few long exposures. The rest of my time in Utah was spent exploring Buckskin Gulch, and a bit of familiar country east of Escalante. And then I returned to buy a 'new' film scanner and get to work on the images from this trip. I have been very pleased with how the Summer has transpired this year - not once was I prevented from photographing Idaho's mountains because of forest fire smoke - for the first time in many years. I figure I have carried my big camera and backcountry gear for 12 days of backpacking on three trips this Summer, visiting new country north of McCall, and revisiting areas of the Sawtooths and Upper Little Wood river. It was very special to camp at Edna Lake in the Sawtooths, and by bringing an old photograph I was able to locate where my camp was the last time I camped there ... in 1974 when I was 15 years old! To end this collection of deep thoughts, I am happy to announce that I have recently made arrangements with a printer in Boise to make bigger prints than I can make with my printer. This has worked out very nicely, and the customer that requested 15 24X30 inch prints seems to be very happy with the results. 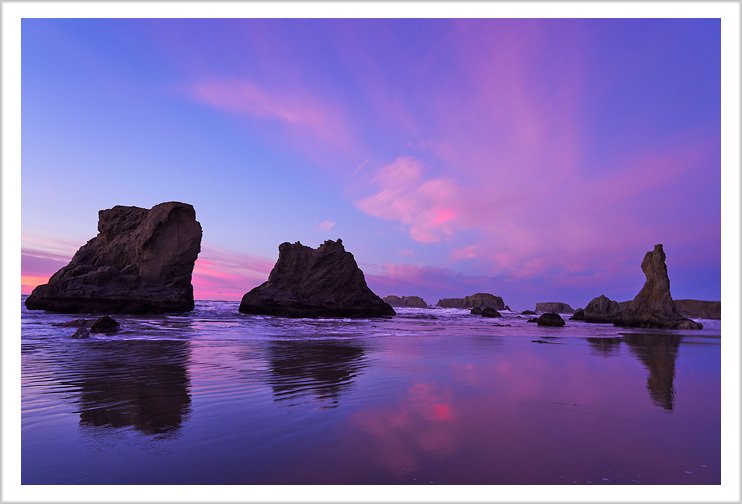 So, to announce, if you see a print available to purchase in the 22X28 inch size range, it is likely that it is also available at 24X30 inches (for $450) and 28X36 inches (for $550). Just contact me and ask! I hope your Summer has been as wonderful as mine has been, and I look forward to meeting new people so don't hesitate to contact me. And, come up and visit my gallery! During these last days of 2013, last Summer now seems like a long time ago. I was able to spend a few days at Craters of the Moon over Memorial Day weekend. I highly recommend visiting there during this time of year, the flowers were beautiful and aromatic offering a wonderful contrast to the stark lava flow. In July I spent several days at the Chamberlain Lakes, which are at the base of Castle Peak in the White Cloud Mountains. 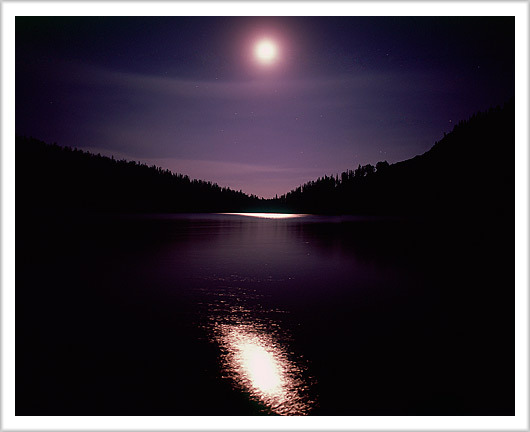 With a full moon and calm, warm nights next to a high mountain lake, I was inspired to experiment with the personality of film and long exposures. I am pleased with the results, it seems to me that the possibilities for photographing nature are endless. And then - another bad fire season ... all of August and September it was just impossible to photograph the high mountains of Idaho. The only break I got was a photograph of Surprise Valley in the Pioneer Mountains. 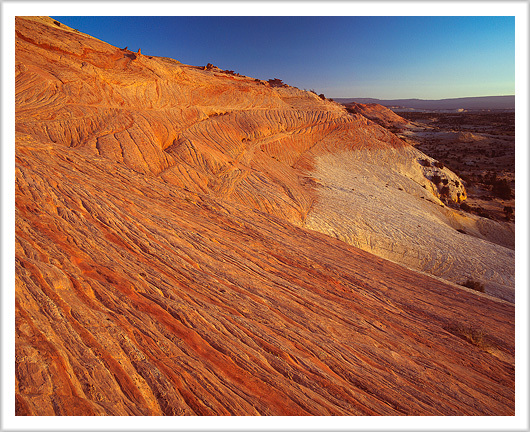 I had never been there and will definitely return, it offers some very nice opportunities for landscape photography. 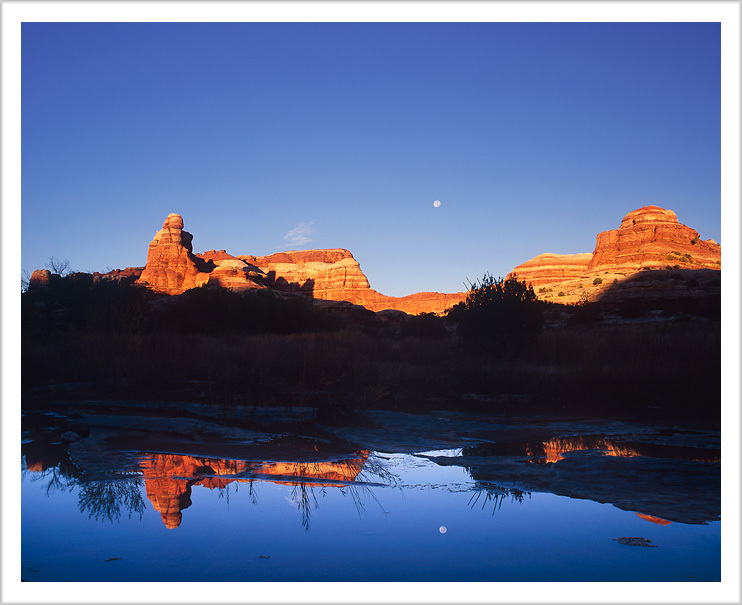 October is my favorite time to be in the Canyonlands country of southern Utah, and this year's Fall trip began with me exploring a huge area not previously explored or photographed. I had intended for years to visit the side canyons of the Dirty Devil River, and in particular had heard that Happy Canyon was photogenic. Given that I selected and scanned and worked a total of 11 images from there, I would say I was not disappointed. 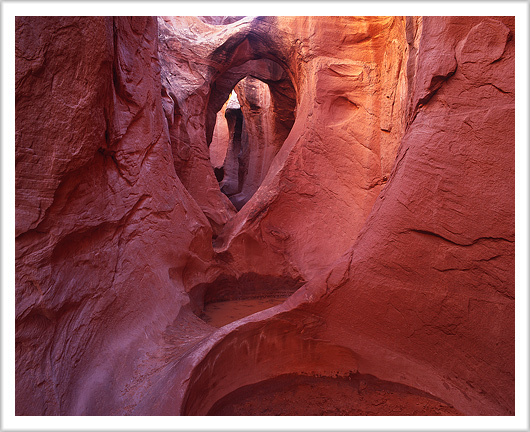 The bottom of Happy Canyon, where it becomes such a wonderful slot canyon of carved stone, is one of the most remote and hard to access canyons in Utah. The route I selected to try turned out to have a certain poetry to it, I think - drive the 16 miles of four wheel drive road down Poison Springs Canyon, then hike 8 miles up the Dirty Devil River, to get to ... Happy Canyon! 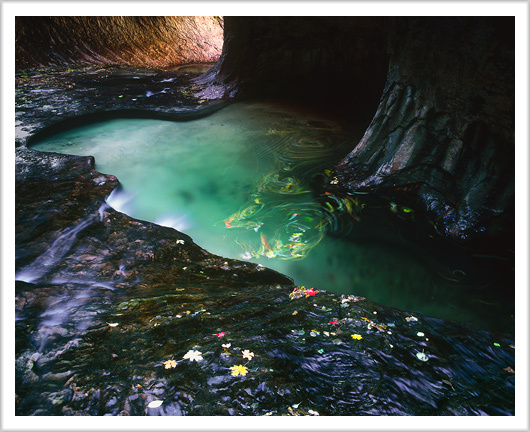 I spent two nights at the bottom of Happy Canyon, which gave me a wonderful full day to photograph inside 'Happy'. I decided to keep the blue cast in shadow wherever it occured naturally on the film, as it seemed to me to enhance the mysterious feeling of the image. 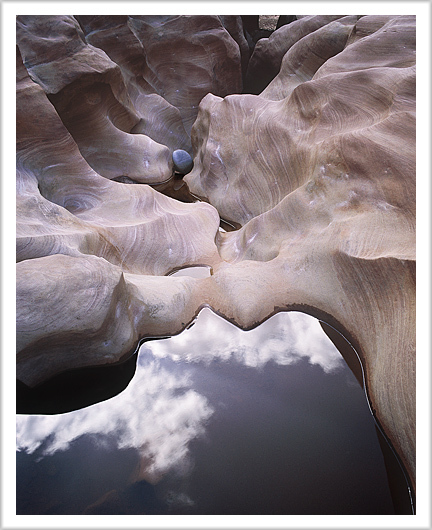 I spent my remaining time in the White Canyon area, visiting my favorite spot to photograph carved stone, in lower Gravel Canyon. And so I guess that is the year 2013. Just to mention, I completely re-did this web site from scratch this year, which was it's own adventure in self-teaching code. I would appreciate any feedback and suggestions of things you think I could do to improve on what I've already done. I had several days of heat and blowing sand, a few days of rain, and many days of perfect temperatures and peaceful calm. 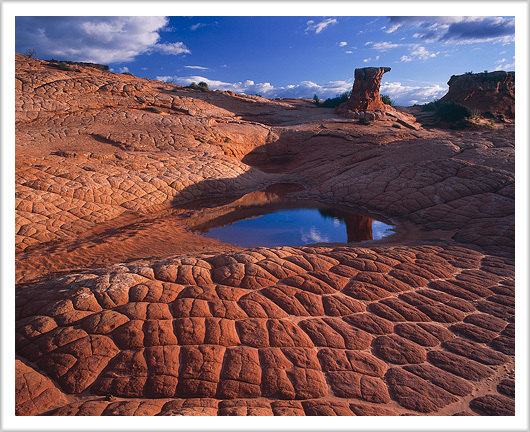 In a nutshell, a normal experience for a Spring trip to the canyons and slickrock of the Escalante River system in Southern Utah. 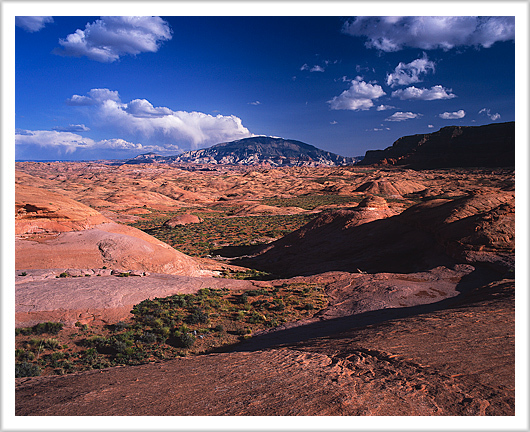 The image above was taken at the beginning of my third week there, quite near where I was camping out on the Spencer Flat road just east of the town of Escalante. 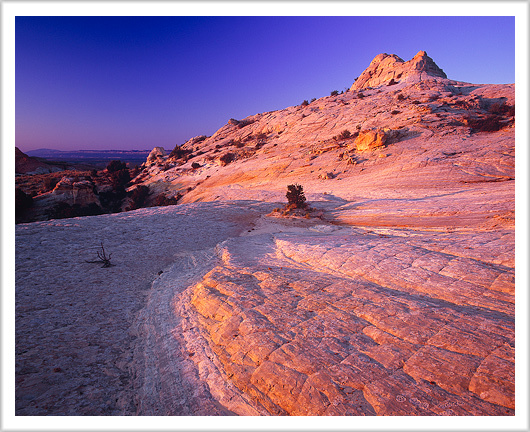 The slickrock in this area tends to be nearly white with areas of red and pink, and the red light of sunrise 'painted' very nicely on the rock, I humbly think. 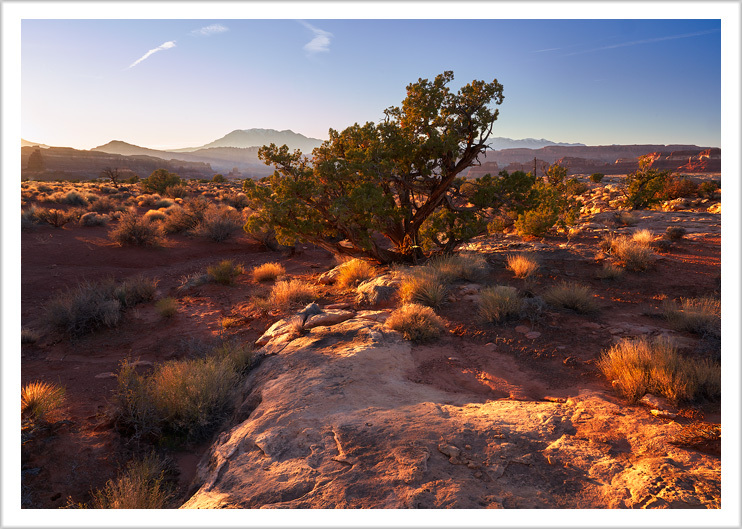 Since I live in the forested mountains of Idaho, it is always a special treat to kick start the Spring season by spending some time in southern Utah ... as I like to say, just to wiggle some red sand between my barefoot toes. I spent my first two weeks exploring new country from a base camp at the head of Davis Canyon near the end of the Hole in the Rock Road. This area has a feeling of 'being out there', since you are 50 miles of dirt road, canyons and washes away from pavement. All it takes is a hard rain, and the road becomes undrivable. I once saw a flash flood take out the road and a ten foot high culvert without seeming to try very hard. My first goal was to backpack into Llewellyn Canyon, where I spent a couple nights. This canyon is one of the most remote in southern Utah, I think, and it was very nice to see one of the few canyons in the area I had never been to. The bottom of the canyon has a wonderful stream and pools of water, and the upper part of the canyon turns into a challenging slot. I have a feeling that I will return to Llewellyn, and to the endless slickrock country nearby. Towards the end of my second week I decided to just wander out across the slickrock for the night. Since I did not know what I would find, I carried enough water for two days. I think I will do more trips like this in the future - it is quite liberating to be fully self-contained with no particular place as a goal. Not knowing what you will find is definitely nice to experience in these days of guidebooks, GPS and cell phone coverage - I had none of these distractions. 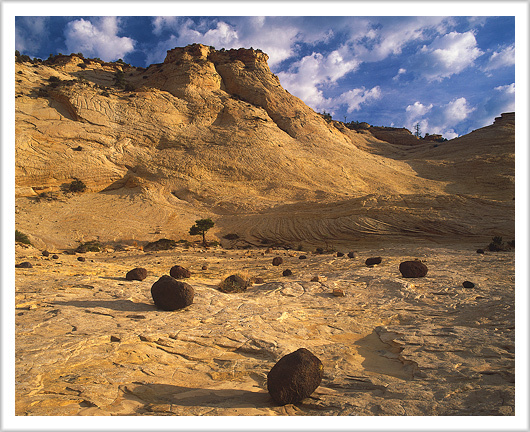 I ended up camping in a nice complex of slickrock arrangements of domes encircling floor-like areas. It was the highest spot in miles, and there was a wonderful view. I could look south past Navajo Mountain towards endless mesas in Arizona, north I could see all of the Escalante River system and the distant Henry's Mountains. Looking west I could see the Kaiparowits Plateau ... that was the view in my 'front yard' outside my tent. It was very peaceful, and I had the feeling that perhaps I was the first person to ever camp there. After two weeks, as I drove back up the Hole in the Rock Road, I decided to camp for a night near a complex of popular destination slot canyons. 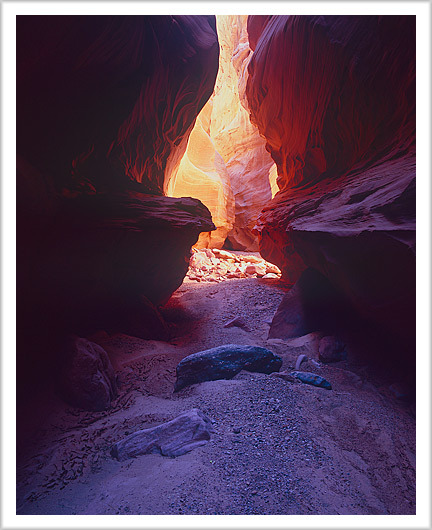 I felt that I had unfinished photographic business in a very nice slot canyon called Peekaboo. I was able to get into the exit of Peekaboo with my camera gear before the crowds, and I had a wonderful photographic session on a wonderfully peaceful morning. Since I had to negotiate several somewhat deep pools of water, I worked my way up the canyon with my boots in my pack, scrambling barefoot using my tripod for balance. It was one of those rare photographic sessions where everything went at what seemed a perfect pace with everything flowing with a calm solitary sense of perfection. As I finished my work, the first crowds appeared and I stealthily exited the upper canyon feeling very good about the morning. After a much needed shower in Escalante and a few exploratory day hikes, I spent a couple nights in Sand Creek Canyon, with a nice long day hike into nearby Death Hollow. I found the area near my camp to be quite photogenic, and the light and sky cooperated to create some nice compositions. I returned to the trailhead to find a problem with my truck that I am very glad did not happen down the Hole in the Rock Road - one of my spark plug wires had disintegrated into three parts. I was able to make an interesting drive on 3 cylinders from the town of Boulder to Escalante, where I got new spark plug wires. I am definitely a big fan of my 1999 model of Toyota Tacoma. I decided that it was time to return home to get my film processed and get these new images scanned, worked up and available for sale. I hope you enjoyed reading this, and please contact me if you would like to know more about these recent images and country. Now my attention will turn towards getting into the high country here in Idaho, hopefully with a more diminished fire season than we had last Summer. This is the first in a series of news reports from my home 'up a creek in Idaho'. 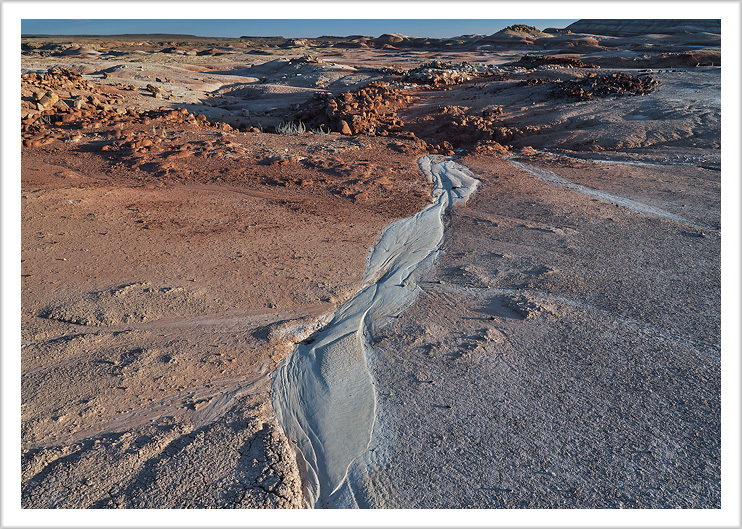 I hope you enjoy the stories I tell about these images, and that it inspires you to take some time to have your own personal experience in nature, whether in remote wilderness or in the places nearby where you live. First of all I want to thank all the people that have ordered prints in the recent months, I hope they have been a pleasure to see in your home and work spaces. I am currently preparing a new set of prints for a show in my gallery, and I encourage anyone in the Boise, Idaho area to contact me to schedule a personal showing. 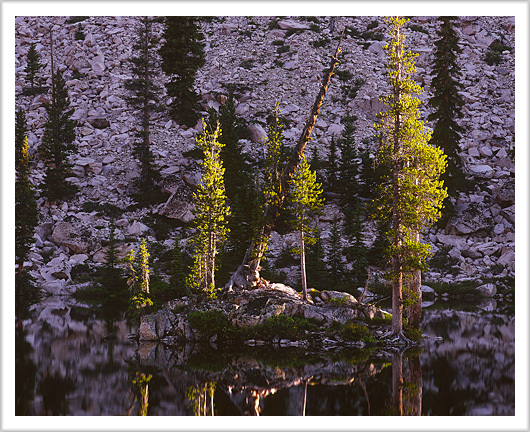 The images here embrace work I have created from the second half of last year, and begin with a sunrise on a lake high in the Sawtooth Mountains of Idaho last July. 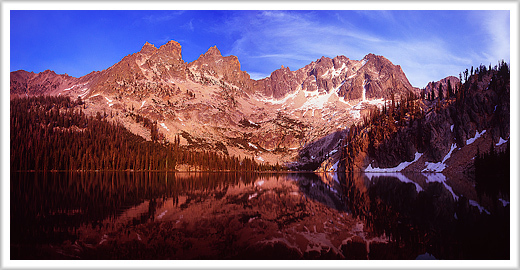 This lake is situated below a granite spire that is a favorite place for rock climbers that visit the Sawtooths, colorfully called the Finger of Fate. I had been to this lake many times in the past, to climb 'The Finger', but this was my first time to visit this place with medium format camera gear. I took this picture of first light on trees on an island, from just about 10 feet from my tent. It was nice not to have to carry my camera gear in a pack on a long predawn hike from camp to photograph the first light of day! Alas, then Southern Idaho became engulfed in forest fire and smoke - very problematical if not impossible to work around when doing nature photography. On the remote chance it had escaped the smoke from the fires, I spent a week hiking and photographing in the Upper Pahsimeroi area of the Lost River Range. 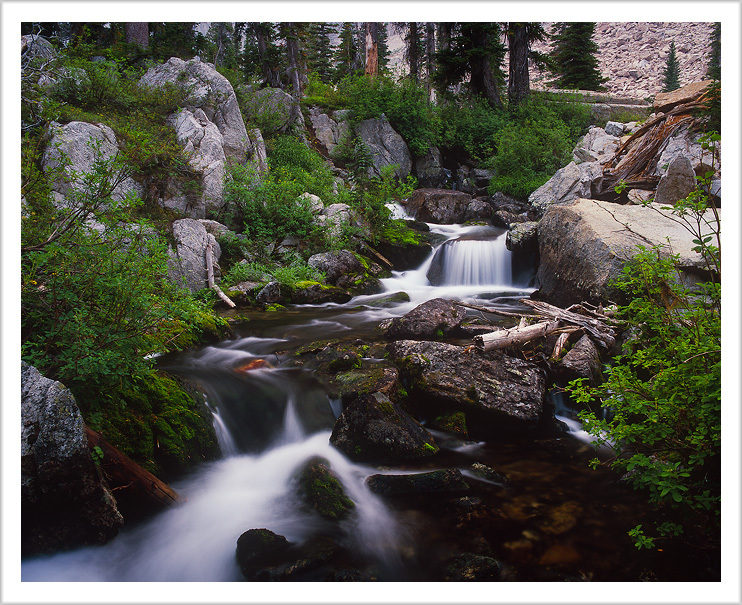 The Upper Pahsimeroi is one of my favorite places in Idaho, not only very scenic but also seldom visited. It has the unofficial nickname of being called Little Switzerland. Unfortunately, most sunrises and sunsets were obscured by very thick forest fire smoke. With so many fires burning in southern Idaho, there were times that it was truly hard to breath. This did not stop me from exploring all the trails, lakes and even a few off-trail areas, and fortunately there were clear skies for at least one sunrise at Pass Lake. Towards the end of the week of hiking, I found myself back at my truck in late afternoon, at the trailhead on the west fork of the Pahsimeroi. The sun was a glowing red orb visible to the naked eye because the smoke was so thick. 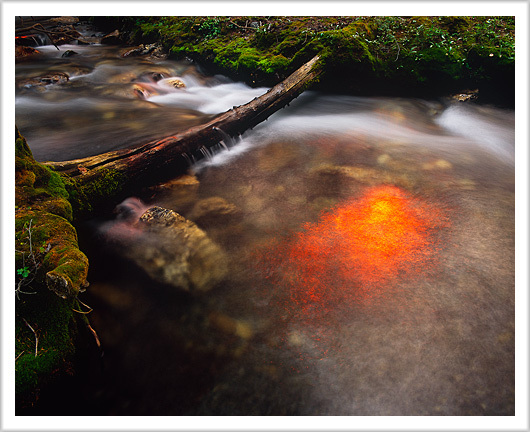 Much to my excitement, I noticed that this red light cast a mysterious and very unique expression of colors on the water, trees and mosses. For my personal tastes, the image I got was my favorite of Idaho images from last year. Nature continues to share with me new ideas for how to photograph the landscape as an art form. Most of September I was busy preparing for the opening reception for my new gallery, and the smoke from the fires continued to make photography very challenging at best. A high stress memory of last Fall came for me 4 days before the opening reception. It was very dry, fire danger was extreme, and I live up a thickly forested valley ... a volunteer fire fighter from nearby, obviously not thinking clearly, intentionally started a fire, so that he could impress his father putting it out. I spent that afternoon putting personal belongings in my truck and watering down the house as burnt embers fell down on me from the huge cloud of smoke rising above me. Of course everything turned out ok, and the opening reception was a success. The month of October was a very full one for me, starting with a week enjoying the wonderful Fall colors of both the White Cloud and Sawtooth mountains. It is one of my favorite times to be up in the mountains - the crowds of Summer are gone and most trailheads have no more than one other car. This is when I go to the more popular destinations that have trail access. I am very pleased with the results of my week photographing the Fall colors of the high mountains, the weather was perfect, there was a deep calm and peace to enjoy. 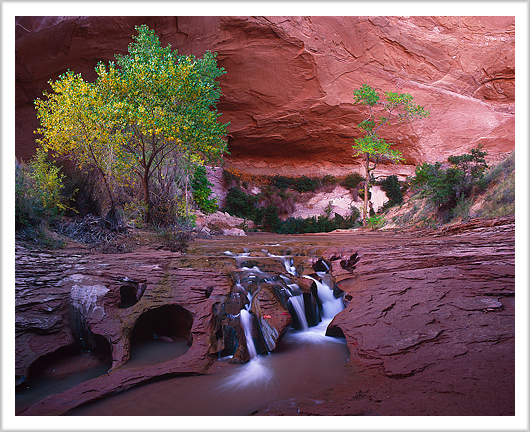 Spring Canyon, in Capitol Reef National Park in Utah, is absolutely beautiful in ... Fall. This was my first time in Spring Canyon, which is surprisingly close to the highway running through the Park. It is, however, only 'close' at the bottom, and otherwise requires many miles of hiking to access. Once again, I had perfect weather and the calm peacefulness of these desert canyons was a real joy. 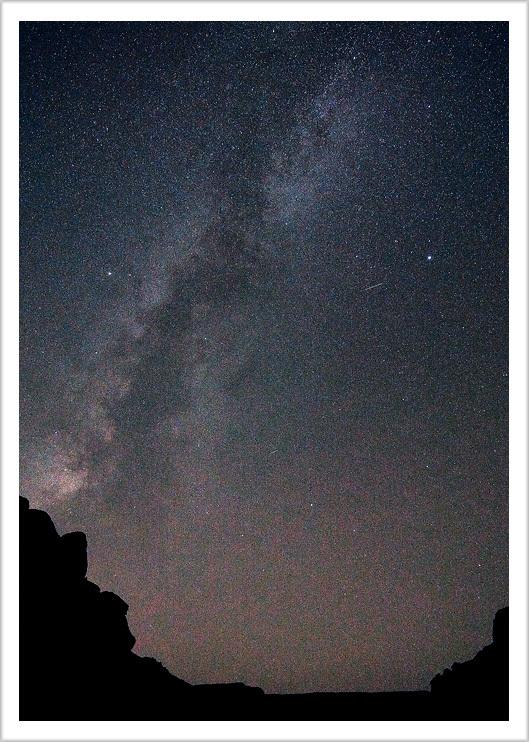 While camping deep down in Lower Muley Twist canyon, one of my favorite memories was to watch lots (hundreds?) of cute little baby red-spotted toads hop around the large pool of water, where I was filtering water at sunset. If I thought there was a way to share that experience I would try, but some things just have to be experienced in person. I am pleased to write that most of November and December I was kept very busy making prints for customers - a true rush for the holidays. It was only in January that I found the time to work on scanning the film and preparing these new images for print and this web site. 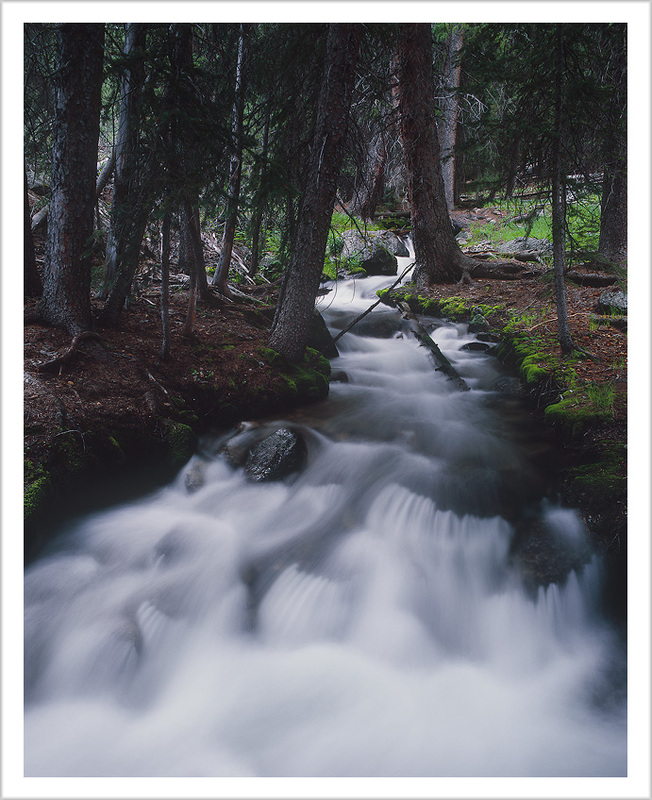 Most of the snow is gone now from 'up the creek in Idaho', and I look forward to sharing my works in my gallery on nice, warm Spring days up here in the forest. 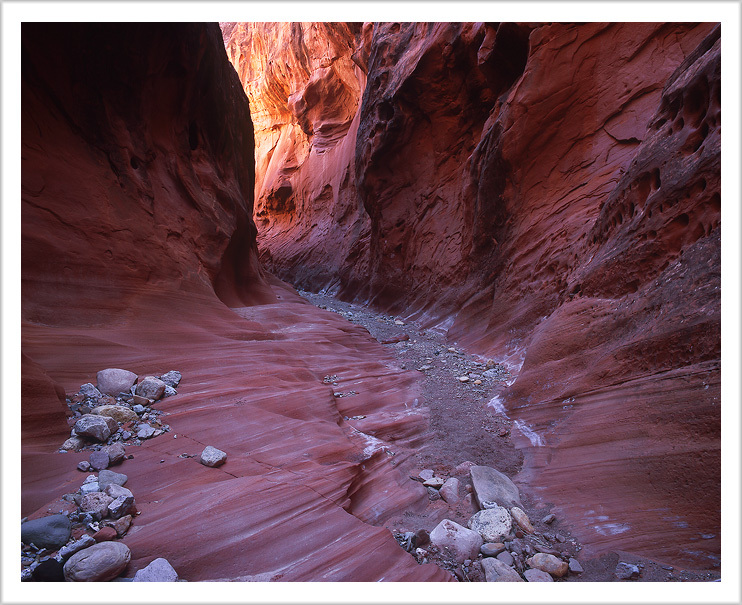 In about a month, mid-April, well, I have some unfinished photographic business to take care of in an obscure canyon in southern Utah called Llewellyn. Stay tuned. I hope you found something of use and enjoyment in my stories. Please do contact me with your thoughts and any questions. Happy Trails.